Trump won the US elections earlier today. And when the going gets tough, the tough gets masking. Increasingly, I’ve come to realise that to do well in the corporate boardroom, rest and “me-time” is incredibly important. To be sharp and efficient in the office, I need at least two to three hours of “me time” to read, meditate, put on a mask; and at least eight hours of sleep. Origins’ new Rituali Tea range is perfect for my beauty night caps. Although I prefer to stay away from tea before bed – the caffeine will keep me up the entire night – I appreciate the anti-oxidant packed leaves blended in masks. Inspired by tea rituals, the range is an indulgent home spa one; especially when you have the time to wind down in the evening or over the weekend. The Matcha Madness Revitalising Powder Face Mask with Matcha & Green Tea ($68) and Oolong-La Purifying Powder Face Mask with Oolong Black Tea & Chai Spices ($68) actually froths up like real tea latte when you blend two spoonfuls of powder with two spoonfuls of water. I was pleasantly surprised by the bits of real tea in the mask. As I rinsed the mask off, the tea bits made good exfoliants. Initially, I thought the powder mask was going to leave my skin dry and tight like regular clay masks. But on the contrary, my face was left feeling smoothe, supple, and hydrated. The next morning, the skin also looked clearer and calmer. Matcha Madness contains oat kernel meal, sodium bicarbonate, potato starch, green tea leaf, camellia leaf extract, sweet almond oil, lavender oil, patchouli oil, and nutmeg kernel oil. Oolong-La contains oat kernel meal, sodium bicarbonate, camellia leaf, nutmeg powder,star anise powder, orange peel oil, vanilla fruit extract, cardamom seed oil, ginger root oil, clove leaf oil, nutmeg kernel oil, basil oil, rosemary leaf oil, and coriander fruit oil. 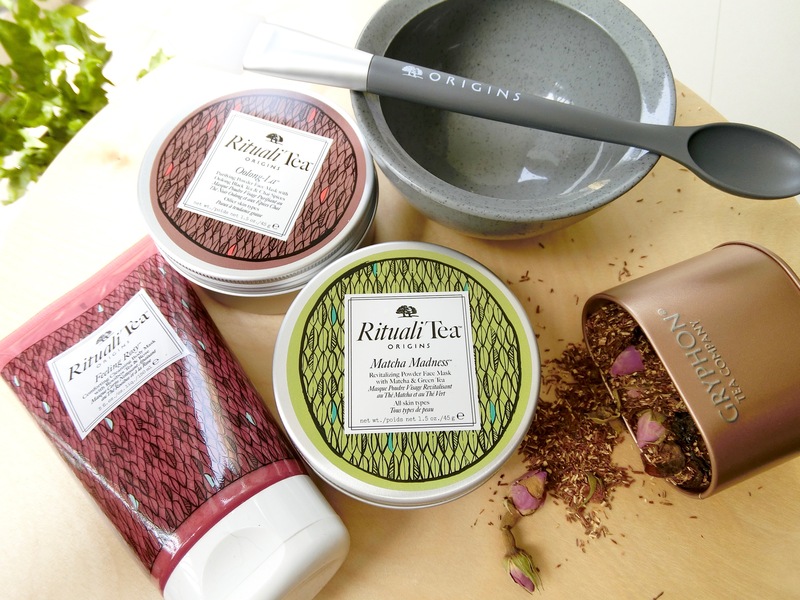 The Rituali Tea Feeling Rosy Comforting Cleansing Body Mask with Rooibos Tea & Rose ($58) is a low-suds exfoliant for that once-a-week good scrub down. The light rose-scent is also calming, making this the perfect addition to a pre-bedtime bath ritual.